I love a good shake. Especially a shake that is rich, thick and deliciously creamy. I created the Menage à Trois Berry Cocktail Shake because I wanted something in the shake department with a little more sophistication than the usual shake fare. And this very adult interpretation of a shake will make grownups smile and nod their approval. Check out the recipe below for the deets. Cheers or should I say SLURP! In a blender add ice cream, champagne, heavy cream, chocolate syrup and berries. Blend until all ingredients are combined and creamy. Adjust consistency by adding more heavy cream. Squeeze chocolate syrup onto the inside of frosted parfait glass and fill with shake mixture. Top with whole strawberries, blackberries and raspberries. 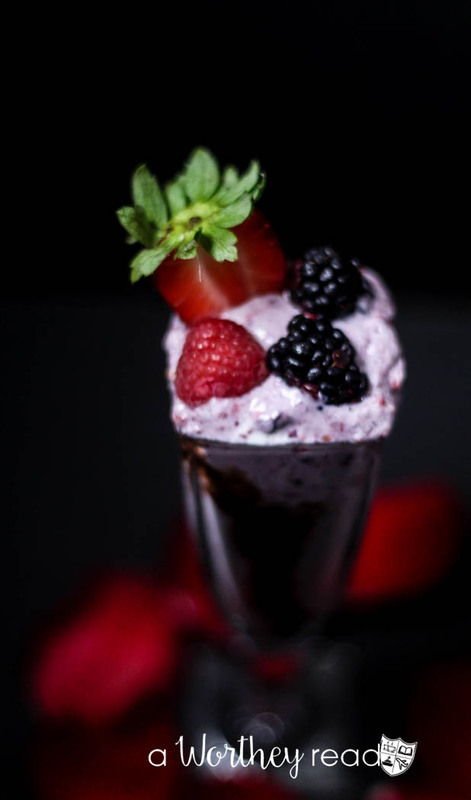 In a blender add ice cream champagne, heavy cream, chocolate syrup and berries. Blend until all ingredients are combined and creamy. Adjust consistency by adding more heavy cream.